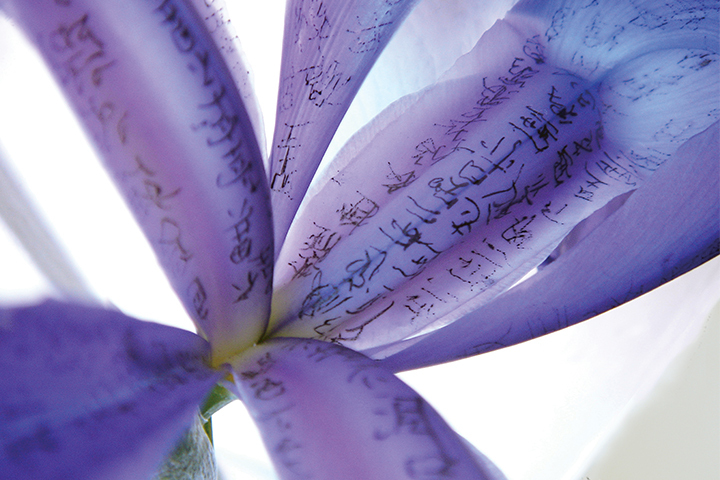 Iris Mantra is the first work that the artist has developed in the Mantra Series where she writes the Heart Sutra in Chinese characters from memory on ephemeral materials. In this work, the characters of the text about the Buddhist notion of impermanence decays and transforms with the natural texture of the flower. The work uses an ephemeral material to reflect on the process of change when a spiritual belief becomes materialized. The work started as a performance through the act of writing, became a scripted object, and then recorded as a photograph.